What happens when you lock a bunch of web developers into a room and give them an unlimited supply of pizza and Red Bull? You get lots of cool new features at the WarehouseTWO website. This is a new check box displayed under “Search Options”, on the SEARCH screen. Checking this box prevents your company’s posted inventory from being included in search results. This new feature prevents users from double-counting their own inventory when looking for a quantity greater than what their company currently owns. This is a new drop-down list available on the SEARCH, MULTI-SEARCH, POST INVENTORY and RELATED ITEMS screens. This feature controls how many records will be displayed on the screen. Available values are “10”, “25”, “50” and “100. Previously, the number of records displayed on these screens was fixed at “15”. This new feature gives users greater control over whether to scroll or paginate when viewing a long list of items. We have added a reminder message that appears when your search yields zero results. Finding what you need via WarehouseTWO often should be a two-step process. Step 1 is to search for the item, typically by part number. If you do not find what you are looking for, step 2 should be to send out a BROADCAST REQUEST email inquiry. Your inquiry will be received by every distributor participating in the selected community, including many, many (too many!) distributors who do not post their inventory data to their WarehouseTWO accounts. Our BROADCAST REQUEST function is one of the most powerful tools available at our website. Frankly, we are surprised that it does not get used more. So, with this new functionality, we are reminding you to send out more BROADCAST REQUEST inquiry emails. In the “System Notifications” functionality, we have eliminated the “Active” check box on all tabs for which either the check box was checked by default and was uncheckable, or checking an “Active” box was redundant to checking another box on the same tab. 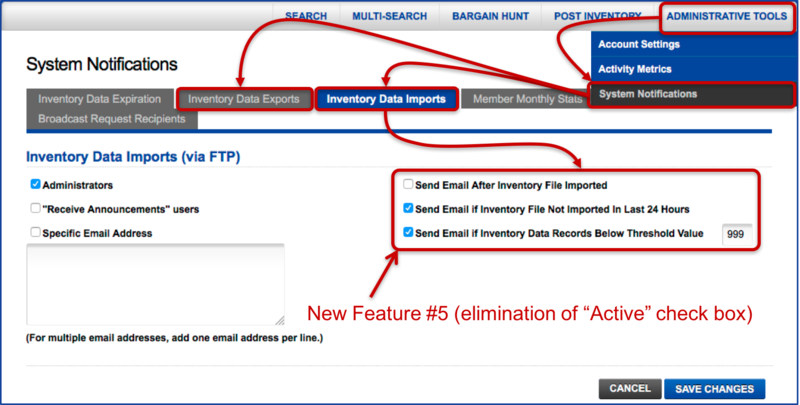 For example, on the “Inventory Data Imports” tab, checking the box next to the text “Send Email if Inventory File Not Imported In Last 24 Hours” automatically activates this tab’s functionality. This improved functionality eliminates redundancy and reduces confusion for administrators. During the last two months, we fixed over a dozen “undocumented features” (bugs and quirks) at our website. Most of these were rarely, if ever, noticed by our users. Still, they bothered us. We won’t list them here. If you did not notice them, then they really never were bugs. :-) Still, we want you to know that we work continuously to improve the user experience at our website. Do you think our website has a bug or quirky functionality? Tell us about it.